One of the money saving techniques that has gained in popularity since the financial crisis and subsequent recession is couponing. Many households are looking to save any amount of money that they can, and clipping coupons is one way to save. Serious couponers claim that they can save up to 50% on shopping costs with coupons. When you consider extreme couponing, the claims skyrocket to as high as 75% or 80% in savings. And, while many people find that that they aren’t seeing huge savings, the amount of money saved is worth the time spent clipping coupons. But, once you clip those coupons, how do you organize them? If you are clipping enough coupons to save a significant amount of money each week, you definitely need a way to keep it all straight. Expiration date: As you organize your coupons, make sure you know when the expiration dates are. You should know, generally, when your coupons expire. You can organize them according to which coupons expire first, to ensure that you use them, or you can group coupons by month or week. Product/brand: Another consideration is the product. Part of getting the best use out of your coupons is stacking them so that you can use more than one coupon for an item. Being able to group products and brands together allows you to quickly stack up the savings, getting multiples, or using more than one coupon at a time. However, you will want to keep track of expiration dates within product and brand groupings so that you aren’t saving coupons that have expired. Your need: Some couponers organize their coupons according to need. They keep track of what they are getting low on at home, and organize their coupons so that what they need most is easily accessible. However you decide to organize your coupons, though, consistency is key. Figure out what method works best for you, and what resonates most with you in terms of convenience and how you remember what coupons you have. There are a number of options when it comes to store your coupons. Ideally, you’ll keep your coupons in some sort of holder that allows you to make use of an organization technique that works for you. One of the most popular ways to organize coupons is to make use of a small accordion file. These files allow you to organize your coupons into larger groups and into sub-groups, depending how you want to arrange matters. Additionally, they are often small enough to take with you to the store, making it easy to get what you need. Another option is to use a binder. 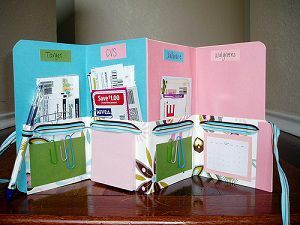 There are a number of binders that can be used for storing your coupons, including those made especially for couponing. You are able to see quickly, through a plastic covering, what the coupon is for, and when it expires. You can arrange coupons how you like for quick access and reference. Others prefer not to take binders and files with them when they shop. Instead, they make shopping lists of what they want, and then gather up only the coupons they need for the shopping trip. This limits the number of coupons that you have to take with you as you shop, and makes it easy for you to review your coupons ahead of time. Finally, it is possible to organize your coupons on your phone. In many cases, it’s possible to get digital versions of coupons that you can keep on your phone. Coupon apps help you search, as well as ensure that you use what’s available and unexpired. Your phone acts as the coupon at checkout, with the cashier able to use a barcode scanner to read the code on your phone. This can be an easy way to keep your coupons with you at all times, but without the hassle of rummaging through physical copies. No matter how you organize your coupons, the important thing is to find a system that works for you. Binders are a great simple idea. I’ve used a binder for some time and it’s a good way to organise. One of the biggest problems is making sure that coupons don’t expire before you’ve had time to use them. I have been using the binder for quite some time now, but what I have found out recently is that I just don’t use the coupons that I clip. Instead, what I do now is grab the coupon inserts and just mark the cover with the date. Since most coupon sites tell you where this coupon is located, I can just flip to the coupon, clip it and take it with me shopping. If I do find something that I truly want in the store, I will do a quick search online with my phone first for a coupon and if none are available, I will just purchase it without a coupon.